Thanks to public input, deputies have identified a woman caught using credit cards stolen from inside three cars in Eagle late last month. Those people who had their cars broken into and wallets or purses stolen since Sept. 22 got reports that someone used their stolen credit or bank cards. We put out a picture of a woman seen using those cards at local stores on social media sites and pretty soon we had enough info that we are able to identify her. Detectives tracker her down and interviewed her. Charges against her are pending. We’d just like to say thank you so much to everyone who helped in this case. 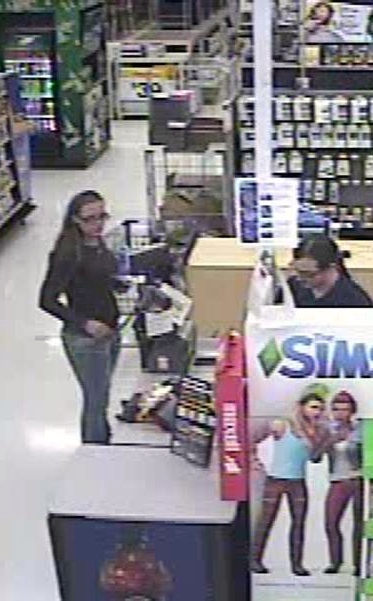 Here’s a picture of the woman using stolen cards local retailers earlier this month. All three car burglaries appear to be crimes of opportunity. On Sept. 22, a resident of in the Eagle/Beacon Light roads neighborhood forgot to lock her truck while it was in the driveway of her home that night. When she went out to her car in the morning, she discovered her wallet was missing. On Oct. 1, it appears someone went into an open garage in the Floating Feather Road/Ballantyne Lane neighborhood overnight and took a purse left inside a car. The third break in happened on Oct. 7 in the Island Woods subdivision west of Eagle Road. Someone broke into an unlocked car overnight and swiped a backpack that had credit cards inside. The best way to avoid being a victim of a crime like this is to lock your car every time you get out of it, no matter where it is. It’s also an excellent idea to never leave purses, wallets, or anything else that holds financial transaction cards in a car whether it’s locked or not.